For anyone on the hunt for an undiscovered gem, here's our pick of the best books you’ve never heard of. For avid bookworms like ourselves there are few things more exciting than accidentally stumbling across the literary equivalent of buried treasure, an undiscovered classic. The new lease of life enjoyed in recent years by previously neglected literary gems such as John Williams’ Stoner, Hans Fallada’s Alone in Berlin and J Jefferson Farjeon’s Mystery In White has encouraged publishers and readers alike to seek out underappreciated and under-read books and authors. 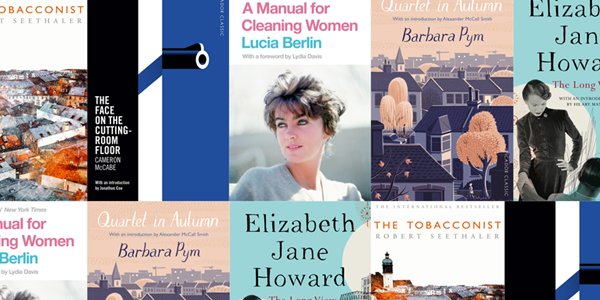 For anyone on the hunt for an undiscovered gem, we’ve made things a little easier for you by collecting together our choice of the best books you’ve never heard of. Lucia Berlin’s writing is dazzling, evocative, rich, unaffected and shot through with references to her own extraordinary life. This collection presents humanity in all its forms: love, humour, addiction, pain and loss and marks the re-discovery of a fiercely talented writer whose greatness had gone unrecognized. For those of you who haven’t yet encountered Lucia Berlin, you’re in for a treat. An extraordinary post-modern detective novel from an author who remained a mystery for decades. When an aspiring actress is found dead on the cutting-room floor of a London film studio, Cameron McCabe finds himself at the centre of a police investigation. As more people around him die, McCabe begins to perform his own amateur sleuth-work. But then, abruptly, McCabe’s account ends . . .
Who is Cameron McCabe? And if not McCabe, who is the author of The Face on the Cutting-Room Floor? Originally published in 1956, The Long View is Elizabeth Jane Howard's uncannily authentic portrait of a very middle-class marriage. It traces the lives of Antonia and Conrad Fleming through the eyes of Antonia, as she looks back on her married life and unravels her choices - good and bad - and the motivations behind them . . .
Elizabeth Jane Howard’s fans include Joanna Lumley, Julian Barnes, Charlotte Mendelson, Rosamunde Pilcher and Hilary Mantel, has called The Long View, ‘a little miracle’. A writer from the age of sixteen, throughout the 1960s Pym faced years of rejection from publishers who considered her unpretentious, darkly funny stories of everyday life too old-fashioned. Quartet in Autumn is perhaps her finest work, it follows the lives of Edwin, Norman, Letty and Marcia who work in the same office in 1970s London and suffer the same problem - loneliness. Lovingly and with delightful humour, Pym conducts us through their day-to-day existence: their preoccupations, their irritations, their judgements, and - perhaps most keenly felt - their worries about having somehow missed out on life. Ahn Do-hyun is a multi-million bestselling, award-winning Korean writer but his modern fable, The Salmon Who Dared to Leap Higher, is his first work to be translated into English. Wise, tender and inspiring, this is the story of a salmon whose silver scales mark him out as different - who dares to leap beyond his fate. It's a story about growing up, and about aching and ardent love. Arguably the best of Crompton's 'lost' adult novels, Caroline is the story of the oldest of four oprhaned children who, having sacrificed her own life to take care of her siblings, cannot bear to relinquish her hold on them. Robert Seethaler’s tender novel about finding dignity and beauty in solitude, A Whole Life, was one of the surprise literary success stories of last year. Despite outselling A Whole Life in Germany, his previous novel The Tobacconist will be available in English for the first time this year. Seventeen-year-old Franz accepts an apprenticeship with the elderly tobacconist Otto Trsnyek and is soon supplying the great and good of Vienna with their newspapers and cigarettes. It is 1937. In a matter of months Germany will annex Austria and the storm that has been threatening to engulf the little tobacconist will descend, leaving the lives of Franz, Otto and their customers irredeemably changed. The Tobacconist tells a deeply moving story of ordinary lives profoundly affected by the Third Reich.